Though you might not have realized, type 1 diabetes has been in the news lately! TV icon Mary Tyler Moore recently died from complications related to type 1 diabetes (among other conditions). She was diagnosed with the condition at age 33, just before the Mary Tyler Moore Show made its debut. She worked tirelessly as a diabetes advocate, serving as international chair of JDRF (formerly called the Juvenile Diabetes Research Foundation). She testified before Congress and led campaigns that raised billions for type 1 diabetes research. “Mary was an American treasure who lit up the screen with her endearing performances,” said Derek Rapp, president and CEO of JDRF. “But for those of us whose lives have been impacted by this terrible disease, it was her off-stage role as a person living with T1D that will be her most enduring legacy.” JDRF set up a tribute website in her honor. You may have also noticed prime minister of the United Kingdom, Theresa May, making headlines due to her recent visit to the White House. Did you know she is the first major world leader living with type 1 diabetes? She was diagnosed just a few years ago, after first being misdiagnosed with type 2. 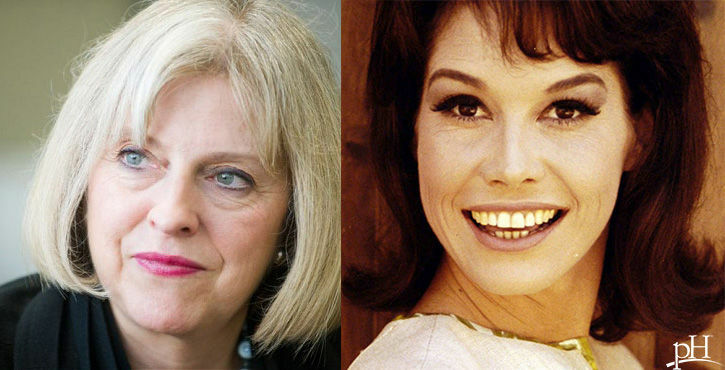 What I found interesting is that both Mary Tyler Moore and Theresa May were diagnosed with type 1 diabetes as adults, despite the fact that type 1 has often been referred to as juvenile diabetes, and type 2 has often been referred to as adult-onset diabetes. However, it’s now clear to me that diabetes of any type can affect adults and children alike. (Click here to read about toddlers with type 2 diabetes). I recently did whole genome testing, and one result from the myriad of results I received was a type 1 diabetes risk assessment. I reviewed those results again after learning adults may be affected by type 1 diabetes. I was lucky and discovered I had a low risk for type 1 diabetes. Briefly, type 1 diabetes is an autoimmune disease. This means the immune system attacks healthy tissue. With type 1 diabetes, the immune system attacks insulin-producing cells in the body. With type 2 diabetes, the body is unable to properly use the insulin it makes, but with type 1 the body makes too little or not enough. According to diabetesaction.org, “[w]ithout insulin, cells cannot absorb the glucose (sugar) it needs for energy production. The sugar made by the body does not enter the cells and instead constantly builds up in the bloodstream. The buildup of sugar in the bloodstream can cause damage to the eyes, kidneys, blood vessels and nerve cells.” Symptoms usually include weakness, fatigue, frequent urination, increased hunger, thirst and weight loss. The causes of type 1 diabetes are not entirely understood yet. Scientists believe genetic, lifestyle and environmental factors are involved with genetics factoring around 80%. This means genetics account for a majority of the risk for type 1 diabetes. Some environmental factors that are known to potentially affect the risk of type 1 diabetes include not being breastfed as an infant, living in cold climates and exposure to certain viruses. Get tested and know the symptoms of type 1 diabetes. Early diagnosis is important for preventing or slowing complications that typically arise from type 1 diabetes. Keeping blood sugar at healthy levels prevents damage to the eyes, heart and kidneys. Reduce exposure to viruses. Certain viruses such as mumps have been reported to trigger an autoimmune response that may attack insulin cells in the pancreas. Learn your family medical history. A family history of type 1 diabetes may be a strong risk factor for developing the disease.